"2 Years ago our daughter was scheduled for another round of physical therapy when we found your school. Since then she has vastly improved her proprioception and balance while at the same time growing pride, enthusiasm and feelings of empowerment, humbleness. plus physical and emotional strength. These are virtues that more physical therapy could not have given her. You have truly changed her life for the better." "This is a great program to help your kids with self esteem and maturity. My son has enjoyed learning martial arts and has made lots of friends. The Barkley family has been a part of our family for over 4 years. I recommend this to anyone looking to try something new no matter your age. We have had an excellent experience." 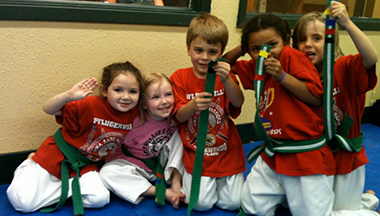 "My daughter improved her confidence & had a lot of fun in their taekwondo class. The kickboxing class is awesome. They take their time to listen to your questions & help you. I recommened this place to everyone. Good prices, professional, courteous & good people. Thank you, Rise Martial Arts!." "Where to begin...words won't do justice to what you all mean to our family. You all are like family to our boys. Your business is run professionally but with heart. You provide a service while providing life skills and examples of what real, God-serving adults look like. Thank you!" "Rise is very helpful for our daughter, due to her autism it is difficult for her mom and I to get her to sit still and listen to us when we're trying to teach her something but in a group setting with her friends she has progressed with learning so much from the instructors at Rise. And all the instructors were very patient, supportive, disciplined and firm." "As a transferee, RISE martial arts welcome us with open arms. They were not just mentors but like a family to us. We are grateful to be a part of RISE and to experience a wonderful, fun learning environment." "RISE is an amazing community of instructors and students striving to bring the best out of each other through martial arts." "You have an exceptional martial arts school...know many kids who are in your school...and all I hear is good things.."
"TaeKwonDo is good, wholesome fun! From it I have gained the self-confidence to launch my own business; something I had dreamed of for years, but never had the guts to pursue until 1 year ago. Reaching goals and milestones in TaeKwonDo demonstrated to me that I could accomplish anything if I just wanted to do it badly enough and was willing to work for it." "Our son looks forward to going to class everyday and has learned so much in less than a year! My husband and I have seen such a tremendous change in the way he carries himself. He was extremely shy before he started going to Rise Martial Arts and now he has so much confidence! He walks with his head held high and actually talks to everyone. All the instructors are great and I can tell they love their job. There is no doubt that they truly care about the kids they are teaching. I highly recommend Rise Martial Arts to everyone!!! "My three children have been students at Rise for about three years. They've enjoyed the classes, the instructors, and their classmates. One of my children struggles some with his physical coordination and we've seen that improve dramatically in the time he's been at Rise. We've also seen his confidence increase as he works hard toward each new belt and eventually achieves it. The instructors are unfailingly encouraging and are personally invested in their students. They work hard to help students succeed without lowering the standards -- something we appreciate in the current "everyone gets a trophy" culture. When one of the kids gets a new belt, they know they've truly earned it. We happened across Rise when looking for something to keep our boys active and out of trouble one ugly winter, and we couldn't be more pleased with the way things turned out." "I love Rise! It definitely is a confidence booster and everyone there is really nice and the instructors take time to help teach you and help you achieve your goal and be a true Martial Artists, and my little brother and sister LOVE it too and it also helps with their confidence and gives all of us something to look forward to." "We absolutely love Rise! Our son is in the 5 year old class and they have helped him with confidence and discipline. The staff is wonderful and you can tell they truly want the kids to learn and do well. So happy we found Rise! "My son and I spent five years with the Barkley family, impelled by teenage energy that needed channeling and cubicle frustration that needed releasing. We learned precision in fighting and how to channel power through the whole body on our road to black belt. We made friends with other TKD families, and the Barkleys made lasting impressions about what it looked like to combine strength with compassion and respect with affection. In that way, we both learned how to become better men." "My Grandson has been a Taekwondo student for a couple of years now. His teachers have commented on his improved ability to stay focused while completing his assignments. He was recently awarded 'Principal's Pride' for doing a great job in reading and having a positive attitude. We are proud of his personal achievement, but also feel that his participation in the TKD program helped him to achieve this recognition. He loves his classes and always leaves wishing they could last a little longer." "I am not sure that everyone truly knows what it means to be a part of a school like this. Not only are you healing/nurturing/continuing your journey with mind, body, and spirit, but the people you meet are phenomenal and inspirational. Some of these people are those that you will remember and laugh with for the rest of your lives. Priceless what the Barkley's do for our community." "My daughters, 4 and 10 have been enrolled for about 6 months now. They both absolutely love going to their classes. The oldest insists on going almost every day of the week. She enjoys the physical and mental challenges and the staff take the time to work with her to improve her abilities. I was initially nervous about enrolling my youngest. She is tiny for her age and can get upset with loud noises. However, watching her in class you can tell that she has changed. She is so focused and even yells just as loudly as other kids in her class. Her instructors really know how to work with these little bundles of energy. They engage and empower them and it really has made a difference in my children's attitudes." "I love the after school program! My child gets TaeKwonDo instruction every day plus a lot of personal attention and coaching in a safe environment. The staff are all very patient and nurturing. I have finally found a program I'm completely happy with." 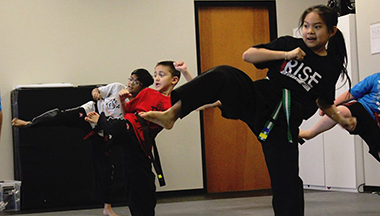 "I have two boys who have been taking classes at Rise Martial Arts since March. I am blown away about their continued excitement when it comes to attending classes. They have been improving quickly and the confidence this is bringing them is beginning to show. I love the mix of structure and fun and all the instructors have been amazing." "My children have attended Rise Martial Arts for 4 1/2 years. Durng that time they have become more centered, self-assured, goal-oriented children. Watching your child become confident in thier ability not only as a martial artist but in everything they do in general is a great thing for a parent. The Barkley family runs a wonderful school, the instructors are fantastic with children of all ages. I highly recommend this school to everyone. They set the bar very high and it shows in their students." "Since the first class we can tell a huge difference in my son self esteem and confident! This academy is absolutely awesome ! The staff have the experience, they are caring, very professional and they also have a very nice facility. My son is 10 and he is setting goal for the first time ever! He wants to go every single day to class! We are so glad we found Rise Martial Arts!" "My son is 6yrs old and i was looking for a karate class for him. I spoke to Steve and it was a relief and pleasant conversation. I knew at that point Rise was the place for Malachi. He loves being there and learning alot.. The staff and instructors are AWESOME!! We love the family atmosphere..I encourage and one with kids to get enroll. You will not regret it." "We LOVE RIse Martial Arts!! We started our daughter with them in their "honor guard" after school program in elementary school. I can't say enough great things about this program. She learned confidence and self discipline, got her homework done and LOVED the tae kwon do classes. She went from being afraid to spar and not wanting to do a competition, to loving the sparing and winning medals in the tournaments. We are so proud of the accomplishments she has achieved. She's now in junior high and too old for the after school program, so she's in regular classes now and loves it just as much. The Barkelys are awesome and supportive and the atmosphere is great for kids - and adults! If you're considering enrolling, DO IT." "We love the facility and that it's a family-owned business. They do a great job making kids feel welcome and channeling that energy. Our teenager enjoys the work-out, the social aspect of it, and the discipline it teaches. Our over-all experience has been fantastic!" "The Barkley family and staff are amazing. My daughter started with them several years ago. After a bad experience, she was suffering a lack of confidence and overwhelming fear. Rise Martial Arts not only taught her self defense, giving her a solid foundation for her confidence, but they worked with her as supportive and understanding friends who helped her grow and come back out of her shell. I attribute a large part of her recovery to their caring and support. Today, she is back to being the outgoing and confident kid she was before. I love being in the facility. Everyone is happy and welcome. You can't get a better environment and I encourage anyone to send their children here!" "We are very happy here. The staff is wonderful, the prices are reasonable and most importantly my kids love it. They have been very engaged and even practice on their own. I am ecstatic we found this place." 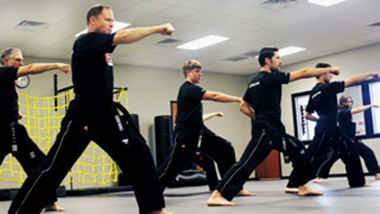 "My son started with Rise Martial Arts in August. He slowly progressed in class to sitting still and focusing. He is a very energetic boy, just like any other 4 year old boy I am sure. His focus just wasnt there starting this class and wasnt for about a month. THEN, it was like something changed. He was focused, started watching techniques and he was in love with TKD. As a parent I tried really hard to make sure terminology was being used at home as well. It was amazing how he responded at home. His attitude changed at home. We had our few bumps in the road at home and the last 4-5 months we have had no issues. Hes focusing his mind, body, and eyes more and using his self control skills more. He was really into wanting to do sports and he is great at those as well but he has not brought up sports at all since starting TKD. The instructors are awesome with the students and really keep them engaged. The kids feel comfortable with them as do the parents." "What a wonderful Martial Arts School. Both my children have gained so much confidence in them selves since we joined this school. The staff is patient, kind and encouraging. My kiddos have achieved so much more than they thought they could and the positive effects reach far outside the the practice room. I have seen marked improvement in both of my children's body awareness and skill level in other sports since we joined Rise Martial Arts. Money WELL invested." "My daughter has been going to rise martial arts for a little less than a year now and she loves it. She is always excited for practice and testing. The instructors are always helpful and friendly. I would recommend this for anyone big or little.."
"My six year old son started taking classes in October (2014) and so far he loves it. I was a little skeptical at first given the size of the classes but I've been very impressed up to this point. In fact, after only a month and change I've already noticed an improvement in my sons confidence and coordination. All of the instructors seem to be very well trained, they are engaged with the children and everyone works to keep the classes fresh and fun. 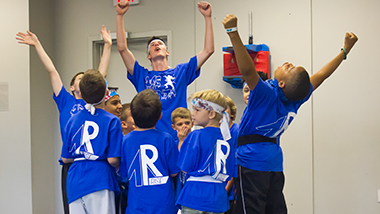 At Rise, it's obvious that the personal success of each child is their top priority. Kudos to the Barkley family for running such a great school. Highly recommended..."
"The class times are very convenient for all different schedules. That was a major factor for our family. My four-year-old has so much fun, and yet it is a disciplined environment." "This place is really nice!!! I have 3 kids taking classes here,they love this place, the staff is very professional and respectful, the site is always clean,if you're looking for a good place for your kids to learn martial arts this is the perfect place...."
"Rise has been a great experience for me and my daughter. They have a flexible schedule and experienced and very encouraging staff that are always willing to help in any way they can. They have helped my daughter to gain more focus, courage and confidence in her day to day life and I am forever grateful for all that they have done." "Both of my children have attended Rise Martial Arts for the past 6.5 years and it has been the most amazing experience for them! The Barkley family along with all of the instructors deeply care for each of their students and have a passion to see them succeed in martial arts. Their patience, professionalism, and enthusiasm for their craft is what has allowed for my children to be so successful. I would recommend Rise Martial Arts to anyone looking for a sport/hobby/after-school program for their children. You will not be disappointed!" "The staff here is very loving and kind and Mr.Barkley and an awesome guy very interesting and his son's and the ladies here are amazing and Kaleb has learned a lot in these few weeks and this was a great investment I recommend this place to any one and just wanted to say thanks again rise martial arts you ladies and gentlemen are awesome." "Rise martial arts is awesome school ! My son loves this place and instructors are great." "I would like to express my gratitude to this school and it's staff by writing this review. They are an exceptional team of teachers and my 8 year old loves going to the classes. I have seen it build confidence in him and he loves learning there. I could not say enough good about this school other than to just say go, see for yourself! No regrets whatsoever!"